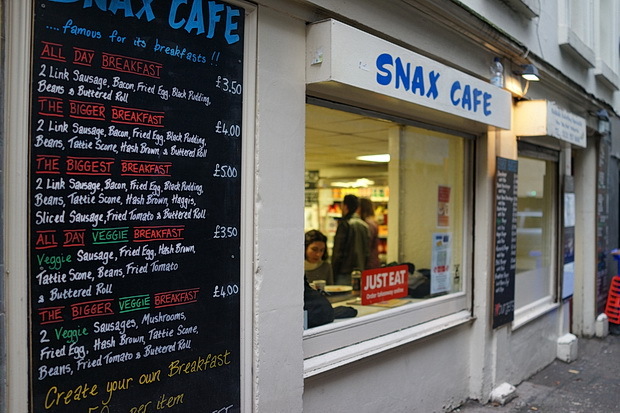 You can’t beat a good, no-nonsense, affordable cafe, and I stumbled across a real gem when I was up in Edinburgh recently called The Snax Cafe – one of three run by the same company. 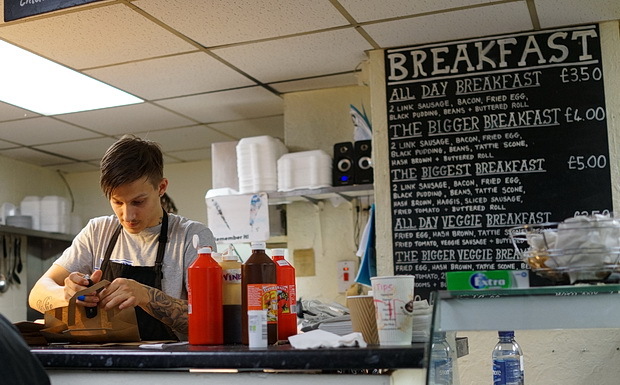 The cafe located at West Register Street is tiny but packs in a ton of goodness, with their menu offering all day breakfasts from £3.50 right up to an enormous meat-tastic offering rising to £5. Veggie versions are also available and they’re equally filling. 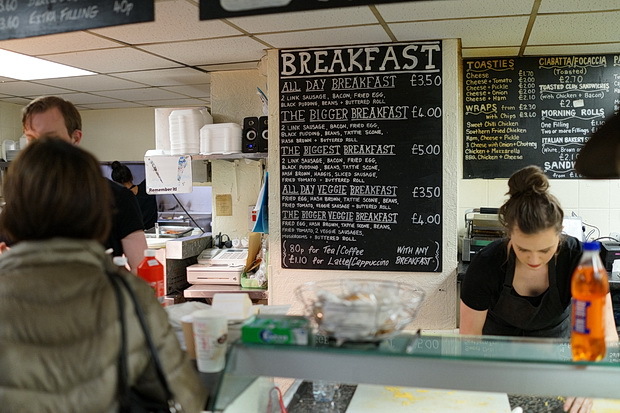 The menu is pleasingly vast and simple; filled rolls start from £1.10, toasties from £1.70, burgers from £2 with tea at £1.20 and coffee from £1.70. 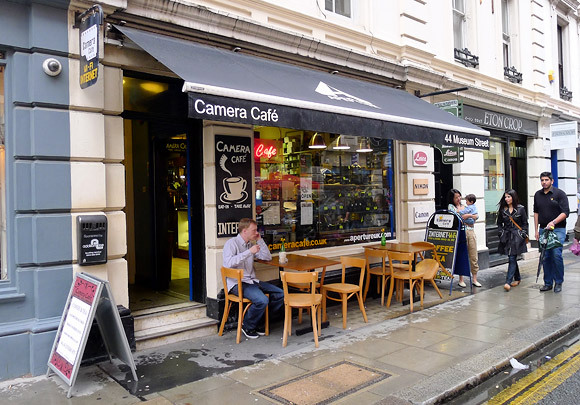 Seating is pretty limited, so you have to time your visit right, and anyone hoping to bring along their 17″ laptop and spend the next three hours browsing the web with a single coffee is perhaps advised to bugger off elsewhere. 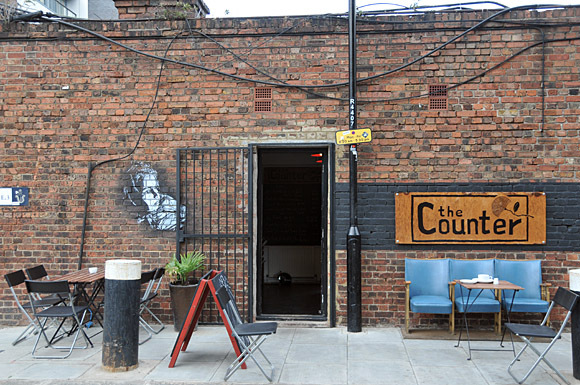 I loved the place though, and thoroughly recommend it to anyone in the area – and I’ll have to check out their other branches next time I’m up in town. A cracking Monday night in Edinburgh at the Black Bull, Oz Bar, Royal Oak and the Jazz Bar Wet streets, a big Moon and an illuminated station roof: Edinburgh night photos Edinburgh in fifty photos: street scenes, architecture, landscapes and the famous castle The Counter cafe, Hackney Wick, E3 – another great London coffee house The not-so-brilliant burning hat flipping busker of Edinburgh – in photos A coffee at the Lantana Cafe, Charlotte Place, Fitzrovia, London W1 A fantastic cafe for central London: The Old Cafe takes over Ray’s Jazz in the former Foyles store Camera Cafe, Bloomsbury – a camera shop and cafe combined!